Need to record, organize, and keep track of your inventories? All you need is an inventory list where you include all the important details of the items in your inventory, such as the item number, name, amount, and quantity. You can even include comments and other supplementary information with regard to your inventories. Know more about inventories through the discussions presented below. Having a list and record of your inventory is vital in order to keep tab of your goods and to know which products need to be replenished. Hence, an inventory list is needed. In order to create an organized and systematized list, an inventory list is usually created in MS Excel. Here is a simple guide on how to do it. Launch MS Excel, and on top of its window, in the search bar, type “inventory list” and press Enter. This would take you to the different options for the styles of your inventory list. 2. Choose an appropriate style. From the given options, choose one that is suitable for your current needs or personal preferences. Then, wait for your template to load, which may take a few seconds. 3. Enter your inventory information. The headings are usually pre-formatted, and all you have to do is enter the information about your inventory, such as the item number, item name, cost, quantity, and net amount. Finally, before you exit, do not forget to save your document. In order to do so, click “File,” then “Save As,” and choose the location on your computer where you want to save your file. 2. Type your inventory list headers. Typically, the headers in an inventory list are the item number or barcode, product name, cost, quantity, and net amount. After creating the headers, adjust the column widths so that the information you will incorporate in your list would perfectly fit in the cells. 3. Enter the inventory information. Just like in the previous discussion, enter the inventory information in your sheet. To compute for the net amount, create a formula by multiplying the cell under the product cost by the cell under the quantity. Repeat this formula by copying it and pasting to the cells under the net amount header or by simply dragging the cells with formula downward to set the formula for all the items. Finally, save your file following the same steps in the previous discussion, that is, click “File,” then “Save As,” and choose the location where you want to save your inventory list document. To check for the completeness of the items in your company, an inventory checklist is needed. Through this checklist, you will be able to identify which items are missing or sold. This is also used to determine if you are running low on stocks for a certain product line. 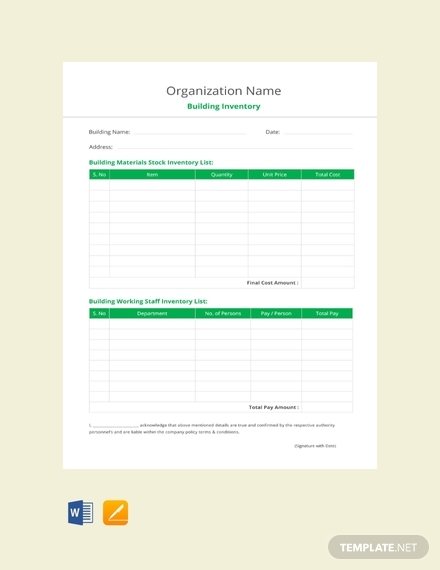 This inventory list will help you keep track of the building materials or stocks. Not only that, also included is a part where you can list down the building working staff. Download this two-in-one template for free. When delivering stocks, make sure you have the right details that go with the items (e.g., serial number, product, address, manufacturer, quantity, price, and status of delivery). It would be bad for business if you keep delivering the wrong thing. 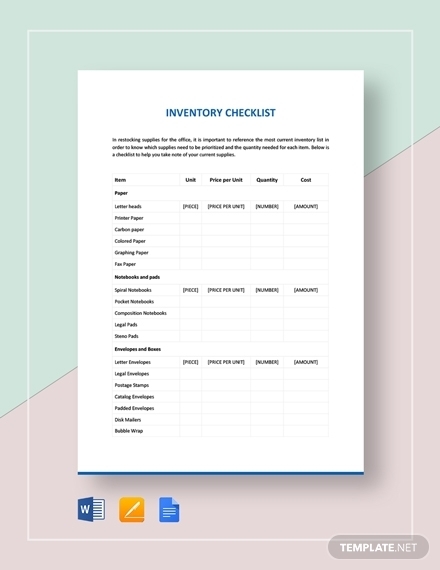 To make sure you have everything in order, utilize this stock delivery inventory list to help you record and keep track of the materials you deliver. When accepting donations from different organizations, it is important that you record them in a donation inventory. 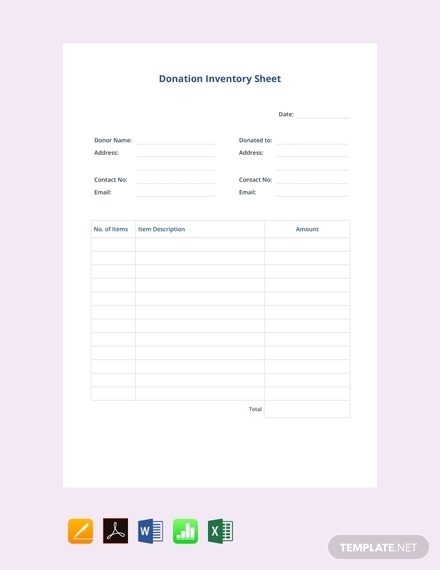 Included in this document are not only the list of items donated but also the information regarding the donor, such as the donor’s name, address, and contact details. Furniture, toiletries, appliances, gadgets, and food—these are just some of the many items you have at home that needs to be listed in an inventory in order to keep tabs of all these household things. 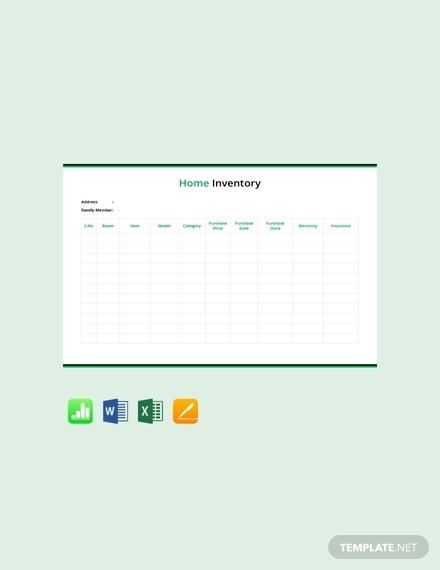 To do so, this home inventory template is very useful and convenient. It can help in organizing your list and keeping all things in place. It is important that you keep a detailed list of the items out on rent including the move-in and move-out comments in order to keep an eye on them in case they are not returned or they are returned in a poor condition. 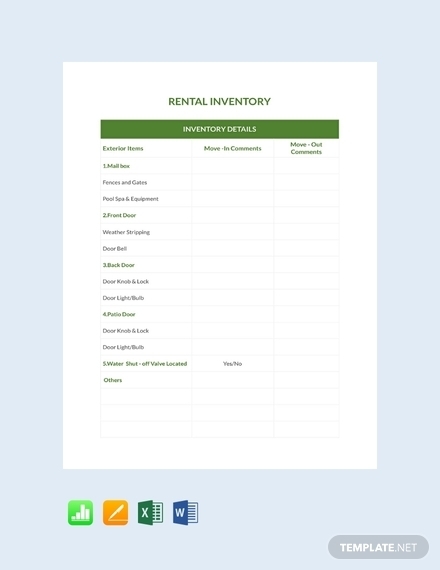 Use this template for your rental inventory needs. 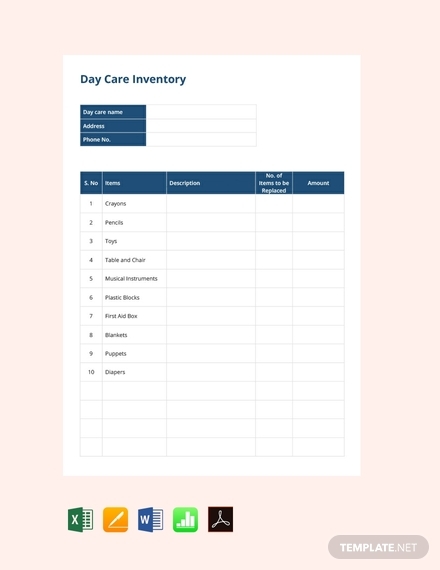 Similar to the items in a business entity, the properties in a day care must also be monitored to make sure that there are no missing items and all the items are being accounted for. Most of the items in the laboratory, such as equipment, materials, and tools, are indeed expensive, hence must be listed in a lab inventory to check for completeness of the items. 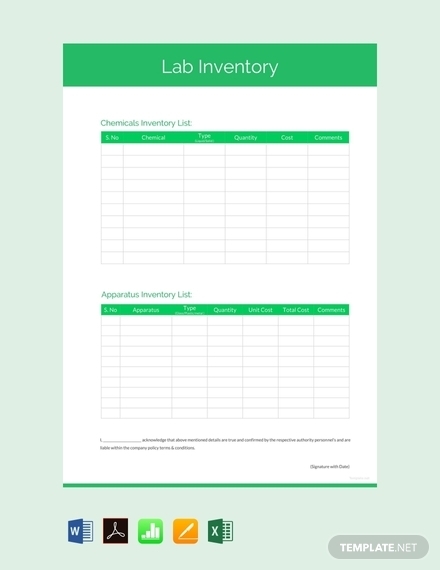 This lab inventory template can surely help you since it is very easy to use and is available in different file formats, such as Google Docs, MS Word, Editable PDF, Google Sheets, Numbers, MS Excel, and Pages. Controlled substances are not your average drugs or chemicals that you can just buy over the counter. These are regulated by the government and for good reasons. For the safety and security of everyone, it is imperative to keep an accurate record regarding controlled substances. 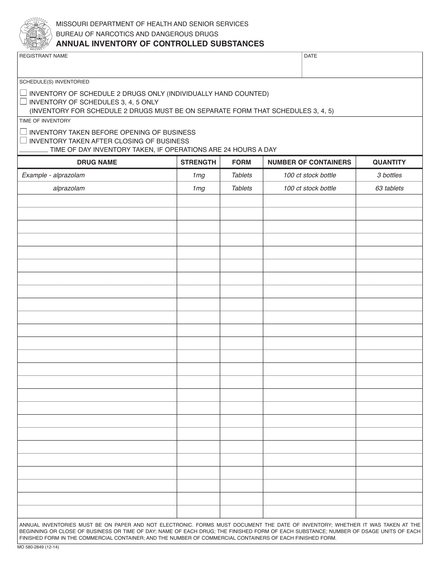 This annual inventory list required by the government should help you keep track of things. 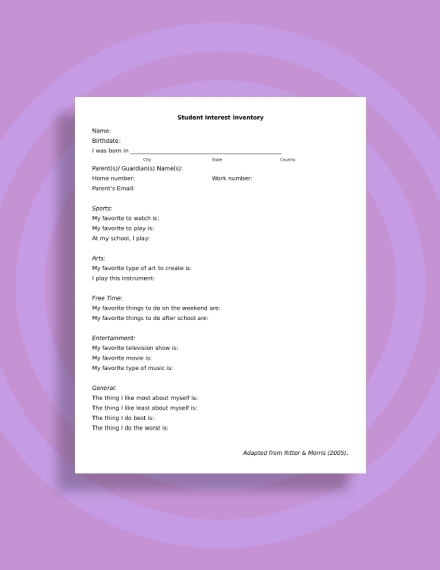 This student interest inventory would help one to understand the preferences and interests of the students, including their preferences as regards sports, arts, food, entertainment, learning style, homework, among others.